The MAGNET program supports improved job readiness and enhanced linkages between industry and academia via networking, trainee internships and research partnerships. MAGNET industry partners represent some of the largest and most respected analytical, environmental, mining and mineral exploration companies in Canada and abroad. 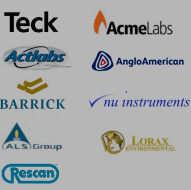 Acme Analytical Laboratories provides mineral preparation and laboratory testing services for mining, minerals exploration and research, and is recognized as one of the leading geochemical and assaying laboratories worldwide. Activation Laboratories provides contract analytical services covering all aspects of analysis from academic research applications to routine quality control functions, and is recognized as one of the highest quality labs serving the mineral industry. ALS Minerals is the leading full-service provider of analytical data service and metallurgy services for the global mining industry, with over 60 laboratories located in key mining districts on six continents. Barrick Gold is the gold industry leader, with interests in 26 operating mines and a pipeline of projects located across five continents, in addition to large land positions on some of the most prolific mineral districts. Lorax Environmental Services is a privately-owned environmental consulting company that provides leading-edge environmental, geochemical and project management services to the mining industry, oil and gas industry, and all levels of government. Nu Instruments (UK) is a market-leading designer and manufacturer of high performance mass spectrometers and accessories, producing state-of-the-art scientific instruments for a variety of analytical applications. Rescan Environmental Services is a private, Canadian-owned, environmental consulting firm offering a wide range of services to the resource development industry. Teck Resources is a diversified resource company committed to responsible mining and mineral development with major business units focused on copper, steelmaking coal, zinc and energy. To improve the exposure of the trainees, host companies are not limited to these partners. MAGNET allows, and encourages, trainees to participate in multiple internships with different companies. Please contact the Program Coordinator if you would like more information about hosting a MAGNET intern.